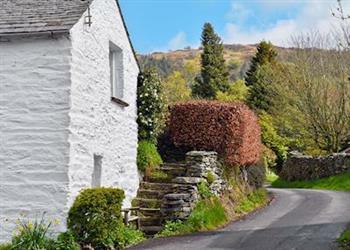 April Cottage in Staveley-in-Cartmel, near Windermere sleeps 4 people. April Cottage near Windermere is a semi-detached barn conversion nestled in the quaint village of Staveley-in-Cartmel in south Lakeland. Close to Lake Windermere and not far from the beaches around Grange-Over-Sands, this property is ideal for exploring the stunning fells of the Lake District as well as the quieter corners of the western coastline. Visit the beautiful church of St Mary’s in Staveley-in-Cartmel or take a cruise around Lake Windermere. There is boat and dingy hire available at Bowness-on-Windermere, but if you fancy something a bit more daring, why not book a water skiing session? The Lake Aquarium nearby is also open all year round, giving visitors the chance to learn about the wildlife beneath Lake Windermere. Other nearby attractions include Grizedale Forest, popular with both cyclists and walkers. Walkers have a plethora of footpaths and bridleways to investigate, whilst day trips to Coniston, Grasmere and Keswick are highly recommended. The beach is 7 miles. With the shop, pub and restaurant 350 yards from April Cottage near Windermere. Ground Floor: Living room: With electric wood burner, 32 Freeview TV, DVD player and beams. Kitchen/dining room: With electric cooker, microwave, fridge, freezer, washer/dryer and tiled floor. Electric central heating, electricity, bed linen and towels included at April Cottage near Windermere. Highchair available on request, at cost. Welcome pack. On road parking. No smoking. Holidays at April Cottage run from Friday to Friday. Pets allowed at April Cottage. April Cottage is in Cumbria; should you be on the lookout for a special offer, you can find all the special offers in Cumbria. It's always worth checking to see what is on offer at the moment. Do you want to holiday near April Cottage (UK1029), you can see other cottages within 25 miles of April Cottage; have a look to find your perfect holiday location.